Our bones are quite strong and do a remarkable job of providing structure, but they are not indestructible. When subjected to excessive forces, either in a single traumatic event or repeatedly over time, cracks can develop. The foot and ankle bones, including the metatarsals, are able to endure substantial force loads, but overuse can lead to stress fractures. Your metatarsals are the long, thin bones running along your foot and bridging the toes and midfoot. A stress fracture is a thin, surface-level crack in a bone, often caused by repetitive motion. The weight-bearing bones in the lower extremities are particularly vulnerable to these common overuse injuries because they absorb repeated forces during activities like running, jumping, and even simply walking. Metatarsal stress fractures are most likely to develop in either the second or third metatarsals. These foot bones are often longer and thinner than the first metatarsal. This area of the foot also sustains the greatest amount of impact whenever you push off the ground while walking or running. Commonly-reported symptoms of stress fractures include pain, swelling, and tenderness. The pain tends to worsen during weight-bearing activities and improve with rest. 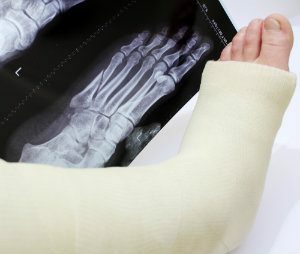 In the case of a metatarsal fracture, the swelling will likely be experienced on the top of the foot. Some patients report bruising as well. Bones undergo a nearly constant process of generating and replacing tissue (known as “remodeling”). If activity levels are too great or too frequent, the breakdown of bone outpaces your body’s ability to repair and replace it. This results in weaker bones, ones which are then more vulnerable to stress fractures. Accordingly, the most frequent causes of these stress fractures is a sudden increase in physical activities, either in frequency, duration, or intensity. The activity doesn’t even necessarily need to be “athletic” for this injury to develop. Excessive walking on vacation, if you normally don’t walk a lot, can lead to this problem. Poor conditioning. Instead of jumping into an activity too quickly, take time to gradually build up your body and prepare it ahead of time. Improper equipment. Make sure you choose shoes with ample shock-absorbing features, and then replace them when they are worn out. Bone insufficiency. Consume plenty of calcium and vitamin D in your diet to keep bones strong and dense. Change in surface. Going from a soft surface to a harder one can increase your injury risk, so you may need to lower your intensity or duration when doing so. Until you are able to come and see one of our doctors here at Dallas Podiatry Works, be sure to follow the RICE protocol. Use Rest, Ice, Compression, and Elevation to relieve pain and reduce swelling in the affected area. For specific information on how to effectively do this, feel free to give us a toll-free call at 972.566.7474 and we can help. You may want to also use a nonsteroidal anti-inflammatory drug (like naproxen or ibuprofen), but make sure you check with us for professional dosage recommendations first. In addition to over-the-counter medications and RICE treatment, we may include conservative options in your treatment plan, such as activity modifications, protective footwear, and casting. These are often able to adequately treat stress fractures, but there are rare cases which require surgical intervention. In these instances, the goal is to support fractured bones with the use of a fastener (internal fixation). This can be achieved with pins, screws, and/or plates. Recovery from a stress fracture can take 6-8 weeks (or longer, in some cases). It is important to know what your timeframe is for returning to normal physical activities, so come see us as soon as you become aware of symptoms. We will provide an accurate diagnosis and plan your treatment to properly address the injury. For additional information on metatarsal stress fractures, or to learn more about our practice, give us a toll-free call at 972.566.7474. If you need to schedule an appointment at either our Dallas or Plano, TX offices, you can do so online or by phone.